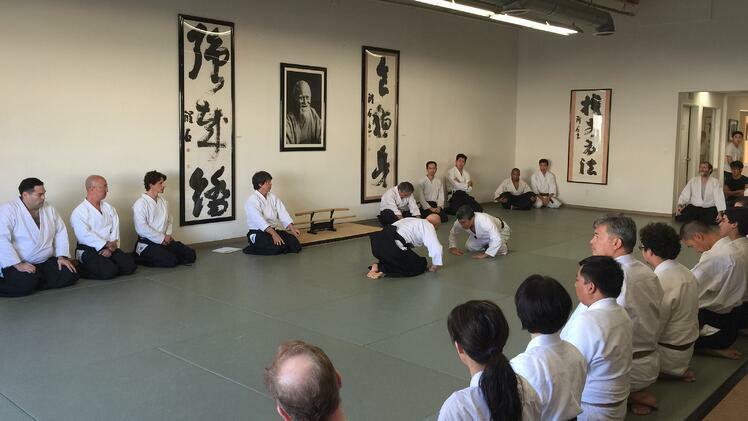 For this article, I wanted to share with you my personal experience of preparing for and taking my black belt for Aikido. I took my test almost three years ago and now that I’ve had some time to reflect on the experience, I’ve realized that preparing for and going through my black belt test taught me three important life lessons that I can apply not only on the mat, but also to my personal and business life. 12-13-14 was a special day—not only because it was the last consecutive date I will see in my lifetime, but also because it was the day that I tested for shodan (black belt) rank in front of Matsuoka Sensei. It was a beautiful day with clear skies just after a huge rainstorm. 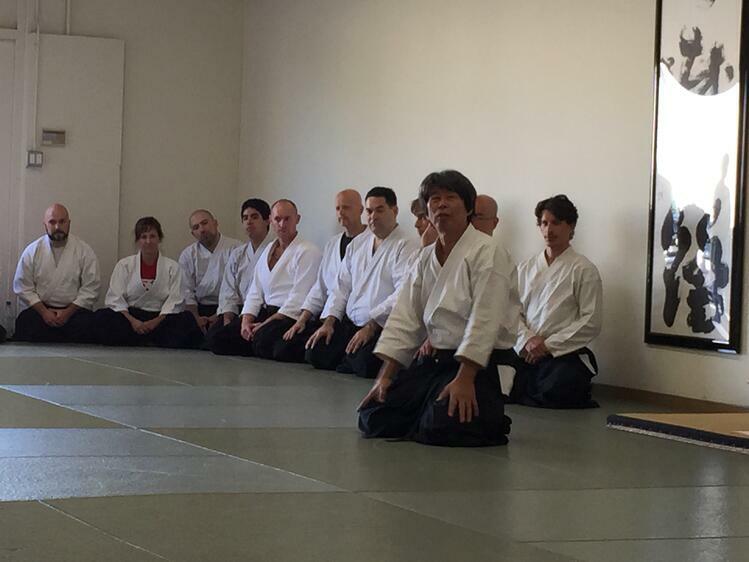 It was also a very intense test day; I was among three other students from Ikazuchi Dojo, and we were all testing for our black belts. 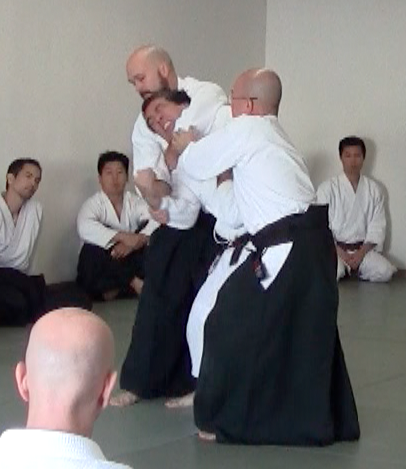 Testing in front of Sensei and the senior students. Five and a half years of training and then another six month’s intense preparation came to an abrupt halt one month before the test date. It was during a practice session of randori (multiple attackers) that I took a rather hard fall that left me limping out of the dojo and kept me off the mat pretty much until test day. You can imagine the range of emotions that ran through me: frustration, anger, disappointment, and mostly, fear that my injury would keep me from testing. 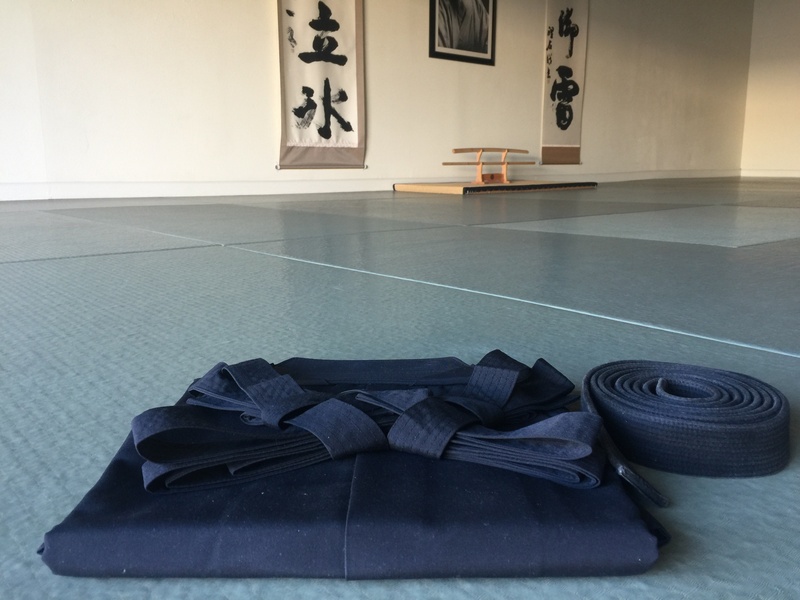 During my time off the mat, I gained a deeper understanding that shoganai is more than a just simple shrug and a “meh.” I was off the mat, but that didn’t mean that the rest of my life stopped. I had to exercise patience and self-control to make sure that my frustration and worry over my injury didn’t turn into negative emotions and spill into my business and personal life. I can’t say that I was completely successful in keeping all of the negative energy in check all of the time. But I certainly was more aware of it than before, and I learned the importance of not getting upset or depressed about a bad situation. So when life throws me an unpleasant curve ball, I remind myself to accept the situation, to refrain from dwelling on what went wrong, and to move forward by keeping a positive and winning attitude. I was able to test wearing a heavy duty knee brace. “Do your best” is how this phrase is usually translated. Most of the time, I hear it said in a light and encouraging way, which is absolutely great. But it took on a whole different meaning during my test. It was the ninin-dori portion of the test, the part with two attackers. Two black belts came up. One grabbed my left hand with two hands, while the other came up from behind me, grabbed my right hand and applied a choke hold. It was a pretty stressful situation, especially because it was near the end of the test and I was already exhausted. With both hands immobilized, I struggled to move out of the hold, and then I momentarily lost my balance. The black belt who had me in the choke hold immediately took advantage and got his forearm deeper under my chin, and suddenly, the uncomfortable choke hold became painful and much more real. To top it off, at the same time, he pulled me sideways, throwing me even more off balance. Afterwards, people told me that my face turned red and they thought I was going to be choked out. And they were right. I remember feeling the pain of his arm against my throat and the increasing pressure against my carotid arteries. “Now would be a very good time to tap out,” I thought. But in that instant that seemed to last forever, I remembered that during my brown belt test, I had been stuck in a similar situation with one attacker, and I had gotten out with a hip throw. This was when ganbatte took on a different meaning. In that moment, “do your best” became “don’t give up.” So I didn’t tap out. The result wasn’t pretty or elegant (I’ve seen the video! ), but by not giving up, I managed to regain enough of my balance to stay on my feet, get out of the choke hold and complete the escape technique. Of course, there are limits to the “don’t give up” attitude, and there are also consequences. In fact, for days after my test, it wasn’t my injured knee that hurt the most; it was my throat and neck from those few extra seconds of choking pressure because I didn’t tap out. And so, I am reminded that in my business life or personal life, when faced with a challenging situation, sometimes the best action is not taking the easy or safe way out. Going for the more difficult and painful solution sometimes generates a victory that may have seemed impossible in the moment or from the outside looking in. I first learned about kaizen, or “continuous improvement,” while working at Toyota Motor Sales, where this concept helped propel Toyota to one of the world’s most successful automobile companies. For some, achieving their black belt marks the end of their martial arts experience. It is the end goal, and once it is attained, people move on to other things. However, this is not for me. Achieving my black belt is certainly an important milestone, but it’s not the end goal. Adopting the mindset of continuous improvement has been instrumental in my personal journey to keep improving my aikido. On the mat, even though I am a “senior student” and wear a black belt and hakama, the reality is that I am still very much a beginner in this martial art. 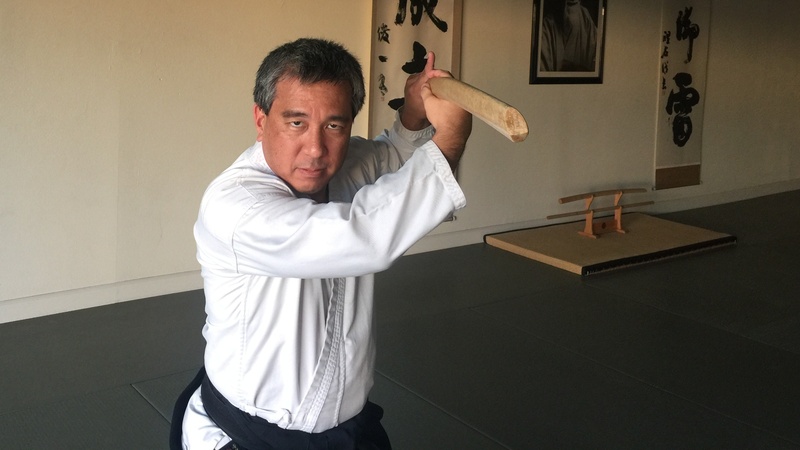 I often describe my black belt as an indication that I am familiar with the basic movements and techniques. But I am far from being an expert, and only by actively seeking and learning can I make sure that I can continue to improve. Kaizen applies to the business world as well. There are always changes in the competition, customers are more informed, new technologies emerge, old ones become obsolete and better methods are continually introduced. As a business owner, adopting the mindset of continuous improvement makes sure that the services we offer or the tactics we use to help our clients remain effective despite the rapid changes in the marketplace. So I remind myself to celebrate the wins, but I need to remember that there really is no end goal. It’s the journey, the grind, and the never-ending effort to improve that makes the win all the more satisfying. I am not always successful in applying these three life lessons off the mat. Quite often, I make mistakes, and hopefully I learn from them. I do know that by reflecting on my experience from my black belt test three years ago, I remind myself that I need to continually refine and polish my mind and spirit to make me not only a better martial artist, but also a better business owner, manager, husband, father and friend. Special thanks to Matsuoka Sensei, Josh Gold, and fellow students at Ikazuchi Dojo for giving me the opportunity to learn and train with you. Gartner Report 2019: CMOs are spending more on technology and less on people.